A “Mini Spy-Hop”… just a rostrum is visible. I hope your weekend was as interesting as ours! On Saturday’s Wake up with the Whales Cruise we saw all kinds of interesting sea creatures…including a good size shark who seemed to be accompanying a pod of 2 whales who were underwater with 19 minute dive cycles. We also saw something swimming along the surface making ripples — Captain Ryan thought it may have been a banded sea snake, but we couldn’t get close enough for a positive identification. We spent most of our time however, watching a pod of two Humpbacks who were on the surface a lot, fairly close to our port side. They were traveling at a pretty good clip and rarely showed their flukes when they dove (we saw a lot of arched backs though). When we deployed the hydrophone, we heard a lot of different whales’ voices, so we knew the Humpback population density underwater near us was high. On the way to the snorkel site during Saturday’s Snorkel and Whale Watch Adventure Cruise, we encountered a pair of very active whales. They seemed to be working something out between themselves, as we saw a lot of surface interactions including a mini spy-hop…with just part of the whale’s rostrum visible (see the image)…from each of them, and lots of splashing and swirling water. Meanwhile, we saw another pod of two on the other side of the boat, and a breach behind us. As we sailed back to the bay after snorkeling and lunch, we saw blows from other whales here and there, as well as another pod of two Humpbacks who decided to surface at our 2:00 much closer by. Before we had even left the mooring for Sunday’s Wake up with the Whales Cruise, we saw whales almost INSIDE of Anaeho’omalu Bay — unfortunately they sounded before we could get to them. Right off the bat though we were basically surrounded by two different competitive pods We got to see lots of pectoral slaps, and lots of water begin pushed around at the surface as these different pods chased each other around. All 7 of these whales were so close to us that we had to turn off our engines…so we took advantage of that and deployed the hydrophone, hearing lots of sounds from all sorts of whales we couldn’t see. 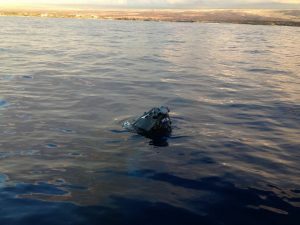 Guests on Sunday’s Mid-Morning Cruise saw at least a dozen different whales in the area between Puako and Maumai (near the Mauna Kea Resort). We had 4 different close encounters, with 3 of those whales surfacing just 50 feet from the boat…and one of those whales was huge! Alala is 65 feet long, and that whale was almost as long as the boat. Ocean Sports Whale Fact of the Day: Do you know the easiest way to distinguish whether that big creature swimming rapidly towards you is a whale or a shark? Watch the way it swims…whales propel themselves through the water by moving their tails up and down vertically. Sharks and other fish move their tails from side to side. Aristotle was the first person to document this difference around 350 B.C. – hopefully you’ll never need to use this information for anything other than winning a trivia contest!